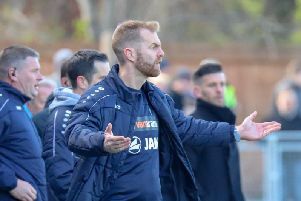 Harrogate Town boss Simon Weaver praised his side's defensive showing as they recorded a fourth successive away victory in the National League. The Wetherby Road outfit beat Ebbsfleet United 2-0 on Saturday, meaning they remain unbeaten in eight fixtures on the road this season and stay third in the table, just a single point off top spot. Callum Howe and Aaron Williams netted Town's goals, while at the other end the visitors were in resolute mood, denying their hosts a shot on target until the game had progressed into injury-time. "It was a really impressive performance from the defenders in terms of their concentration," Weaver said. "I thought the back-line were terrific, but you could see that both widemen were tracking back and doubling up, and from all sections you could see 100 per cent commitment to the cause. "In difficult weather conditions, but on a decent pitch, we managed to play some good football at times. "As far as away performances go, I thought this was very solid. I'm very proud." With driving rain and swirling winds to contend with, both sides found the going tough at times but Town took the lead after half an hour, centre-half Howe heading home Joe Leesley's corner to register his fifth goal of the campaign. Williams then wrapped things up in the 72nd minute, racing on to George Thomson's through-ball and into space before smashing an effort past stranded Ebbsfleet goalkeeper Nathan Ashmore. Reflecting on another strike for hitman Williams, who has netted in consecutive matches since his recall to the starting line-up, Weaver added: "Aaron was probably taken by surprise, the amount of space he found himself in, but it never looked in doubt , his body shape as he got on to the ball. "He smashed it in and I'm delighted for him. That's two in two. "He just gets better and better as a player."